New Orleans police are SUV believed to have been used by suspects in a fatal shooting last month inside a gym on Howard Avenue, and investigators believe that distinctive damage over its front passenger-side wheel could help the public recognize it, authorities said. 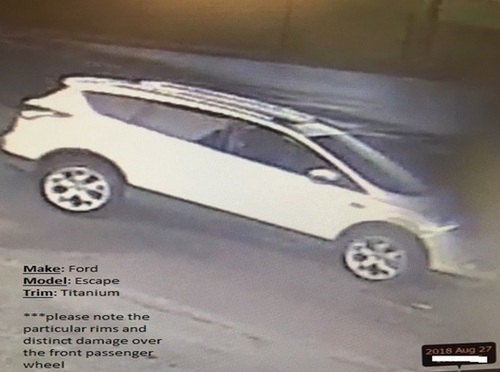 NOPD officers are searching the above pictured white Ford Escape Titanium after it was allegedly used by the perpetrators in a homicide that occurred on August 27, 2018, in the 3900 block of Howard Avenue. The vehicle of interest was reportedly occupied by two male subjects wearing dark colored hooded sweatshirts. At the time of occurrence, the vehicle possibly had an obscured temporary license plate or no license plate at all. The vehicle also has distinct damage over the front passenger side wheel. If anyone encounters the vehicle of interest, please contact any homicide detective at 504-658-5300. Citizens with information that can help solve crimes are asked to call Crimestoppers at 504-822-1111 or toll-free at 1-877-903-STOP.